This page should be viewed in conjunction with a collection of correspondence that provides historical details of the efforts involved in seeking support and approval for The Oswestry and Llangynog Railway during the 1860-1880’s. To view the transcribed correspondence click go to. This was to have been a branch line along the Tanat Valley on the English:Welsh border. The 1882 Act incorporated the Company and gave the necessary powers and practical and financial arrangements for building the railway. The 1886 Act was to extend the time for purchasing land and for building the railway. The 1889 Act was an abandonment Act that dissolved the Company and repealed the above two Acts. The Act had 57 clauses and ran to 20 pages. Railway Number 1: To provide a connection with the Porth-y-Waen branch of the Cambrian Railway. This would give access to Oswestry. This section was to be one mile, one furlong, 5 chains and 10 links long. 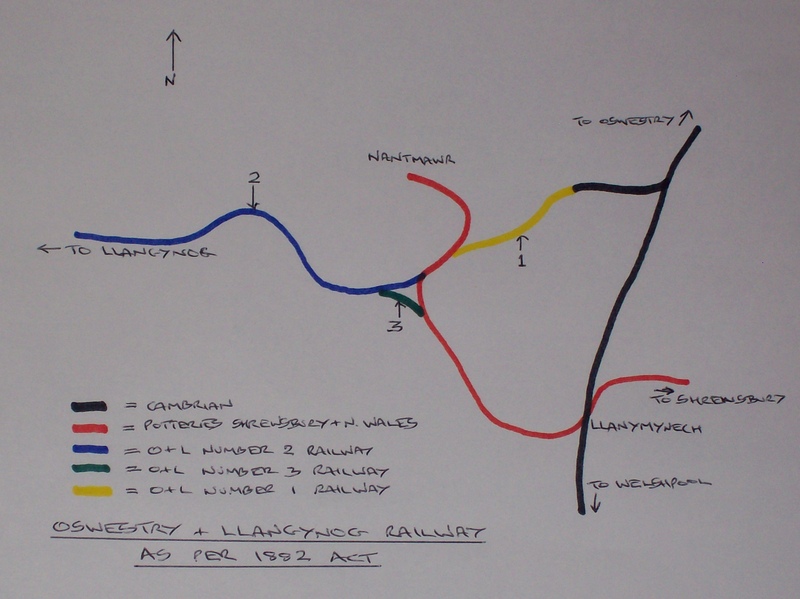 Railway Number 2: This was the main part of the line up the Tanat Valley 13 miles and 2 furlongs in length. Railway Number 3: This was a short fork (3 furlongs and 8 chains) at the eastern end of Railway number 2 that linked the latter with the Potteries Shrewsbury and North Wales Railway branch that ran up to Nantmawr. Railway Number 2 could only connect with Railway Number 1 via a short section of the Nantmawr branch of the Potteries line (see diagram below; only relevant lines shown). The sequence of opening had to be number 1, then number 2, then number 3. This would mean that the railway would be open for traffic to Oswestry over Cambrian Railway lines before the route east to Shrewsbury over the Potteries line. However the latter would have been academic because the Potteries Shrewsbury and North Wales Railway was bankrupt and defunct even by the time of the passing of the 1882 Act. The company was to have between 3 and 5 Directors each of who must hold at least 50 share (£500). The first Directors of the Company were Thomas Dyne Steel*, John Beattie, John Devereux Pugh. (*Institute of Civil Engineers). Thomas Dyne Steel had replaced William Henry Gascoigne Weaver during the passage of the Bill. The latter was mayor of Oswestry 1881-3. – To nominate his own Director to the Company, and replace that person at will. This Director was separate from those nominated by the general shareholders of the Company. – To have his own ornate station built to serve his residence at Llangedwyn Hall, and that this should be completed before the line opened to general passenger traffic. Trains were to stop at this station at his request. – That no part of the railway should be open to the public until that part which served Llangedwyn Hall had been completed and opened first. – To retain full rights over any of his land used to construct the railway. The capital of the railway was to be £150,000 in £10 shares. The “deposit fund” was to be £6238-12-0. This was a bond for compensation of injured landowners etc should the railway not be built. Construction timing: The railway should be built and open to the public within 4 years of receiving Royal Assent. The latter was granted on 10/8/1882. Compulsory purchase of lands should be done within 2 years. Running Rights: The railway was to have running rights over the Cambrian Railway from where the O&L line met the Cambrian Railway into the latter’s station at Oswestry. The Cambrian had running rights over the whole of the O&L. Both the O&L and the Cambrian could run over the short section of the Potteries, Shrewsbury and North Wales Railway that link the two of them. This was an obvious practical necessity to give continuity to the route. The Act gave the O&L powers to maintain this short section of the Potteries line.